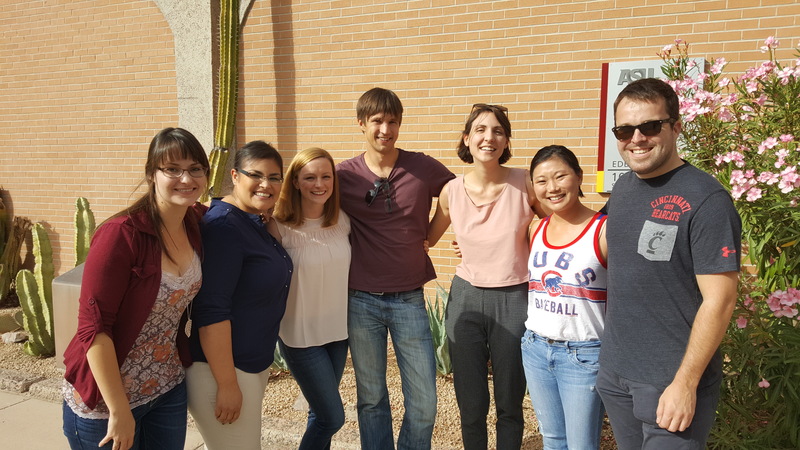 I’ve just returned from a week at Arizona State University, in the SOLET (Science of Learning and Educational Technology) lab, funded by a small NSF Data Consortium Fellowship with Laura Allen. Incredibly productive week with some really great researchers – so thank you to all of them (and particularly Laura!). So, on Tuesday I presented with meetings and collaborations over the rest of the week (as below). Theory Thursday Laura and I spent discussing (1) a paper idea we have (with Andrew Gibson, at UTS), around ‘writing as a lens onto metacognition’; (2) drafting a structure for a paper idea on ‘a theory of change for writing analytics’. I then had a one-to-one with Rod Roscoe – who leads the ‘Sustainable Learning and Adaptive Technology for Education‘ (SLATE) lab – about the various projects, particularly around misalignment, and some of the things we’ve been thinking about around ‘analytics literacy’ (and ‘playful interaction’ e.g., in ‘dear-learner‘). Back to theory, I joined the reading group Laura convenes, discussing ‘Creating Language‘. Friday, I had a series of back-to-back meetings to take me up to departure time, these were targeted at (1) sharing key synergies, (2) seeing where we might build collaboration, and (3) just chatting about research directions, etc. Kevin Kent – We chatted about people’s beliefs regarding learning technologies and their relationship to (1) use of videos in MOOCs, and (2) their beliefs regarding writing tools and their use. One can imagine building resources in this space around ‘beliefs about learning’ (possibly building on epistemic cognition), and their relationship to use of specific technologies – e.g., what kinds of features do people believe tools can give insight on (if any); do people have ‘flexibility’ in their technology use – are they strategic in use of tech to augment cognitive abilities, etc.. We also talked a lot about embedding analytics in contexts, and activities, e.g. getting teachers to compare human-analytics outputs. Tricia Guerrero – We chatted about how to leverage systems (and, particularly feedback systems) to target particular user groups and their salient needs. This is an issue we grapple with in our UTS work too – we want to target feedback, and ensure we can give quality feedback, and sometimes that means giving feedback on low-level features (like spelling and grammar) – but there’s an issue nicely illustrated by handwriting: we don’t want to read beautiful prose and only give feedback saying “you should work on your handwriting” (I experienced this), because this deprives people of the higher-level feedback, and potentially reinforces divisions. This led to a nice discussion of how we scaffold feedback (e.g., linking feedback to examples or/and tutorials on the issue), the role of self assessment (I demo’d REVIEW), and how we translate classroom-feedback into automated tutoring systems. Part of this was around the dialogic process of feedback – including e.g. discussion around exemplars and portfolios and how that might be created through benchmarking systems and intelligent agents. Mike Hogan – Mike’s actually an Irish researcher, who was also over visiting colleagues. We talked about collective intelligence, and the use of improvement science to build participatory collective intelligence and analytics literacies in transdisciplinary learning analytics teams, and how we could share resources in the area.